We usually send one of these out at the beginning of the year to give you a heads up on what we are planning on stocking at some point during the year. First off is bare root trees and roses. This is the stock we will have for the year except for getting in some David Austin Roses in May. You can check out the links on our website to give you the full lists of all the bare root trees. Many of you will remember my reporting that 2018 was the last year for the things we received from L.E. Cooke as they closed down. Some things will be coming from one of our other suppliers, but some things we will not have this year. Bare root asparagus, artichokes, and strawberries are some of those things. We did order packages of asparagus pips from the bulb company along with more onion and garlic bulbs which should arrive around mid-Feb along with the summer blooming bulb order. Available this year that we do not routinely stock are multi-graft apples and cherries, Sierra Beauty Apple, English Morello Sour Cherry, Utah Giant Sweet Cherry, Donut Peach, Fairtime Peach (very late ripening), Gold Dust Peach (early ripening), May Pride Peach (very early ripening), Kieffer Pear (fire blight resistant), Caroline Raspberry, Jewell Black Raspberry and Black Velvet Gooseberry. The Pecans are buried in the soil pile to ‘sweat’ them as they are difficult to get to leaf out. If you want one, it is probably best to put your name in the hat for any that leaf out. Lately, Dave Wilson does not offer Filberts, so we have none again this year, but we do have Almonds, Pistachio (need both kinds), Chestnuts (need both kinds) and Walnuts. 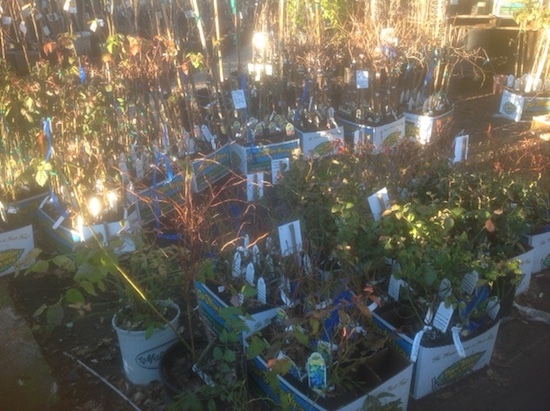 In liner pots, you can find an assortment of wine grapes and concord grapes which we do not always have. We should have plenty of the self-fertile frost hardy fuzzless kiwi this year. We were shorted last year. If you want bare root, it is best to get your name down, and we will call you. Due to time constraints, we have to start potting them up almost as soon as they arrive. Every year we try to mix it up a little along with ordering the perennial favorites. Star Rose Company is now the license holder for the Kordes line of roses. We ordered a few of these to see how they do here, mostly picking fragrant cabbage styles reminiscent of David Austin roses. You can find out more about these at www.kordes.us. Deb and Tanya hit up the L and L show in October and the first of those orders will be arriving soon and will continue into March. A lot of what we get is what we order every year- hanging baskets, tomato cages, plastic pots, Smart Pots, hummingbird feeders, decorative rock, statuary from Design Toscano (some different), and colorful metal roosters/hens (in some new styles) from Regal and fairy garden figures. Following are some of the new things to look for. First off we are excited to get beautiful painted ceramic pots from Spain. We think you will like them. Sticking with pottery, we ordered new styles from Pacific Home and Garden for our glazed selection. We also ordered the full pallet selection of the swirled colored terracotta pots from DeRoma. Also new this year will be EcoClear Products mouse, mole and vole baits that do not work like traditional poisons and have no secondary kill. They dehydrate the pesky critters to death. Keeping with the critter theme, we will also be stocking the live traps for the first time. The ground squirrels are beginning to get out of hand here. Bonide was offering a chipmunk repellant that is supposed to work on the squirrels and we are going to stock it. We ordered from Beyond Borders again. This is the recycled metal art from Haiti with lots of new styles this year. Deer Park Ironworks were offering some very cute metal containers this year, and we ordered them. Dalen had these cute little pop-up greenhouses that we thought we could use at the nursery and offer for sale too. They can fit on our tables. Many of you have heard about vinegar as a good natural herbicide, and we ordered the 30% acetic acid kind made for that. We put in another order with Sester Farms out of Oregon, due to arrive the first of March. This is the second year in a row we have done so. A lot of these varieties we do not get from our regular suppliers and are varieties we have not had before. Some of the things to look for when they arrive are ‘Sester Dwarf’ Spruce, Pink Flowering Dogwood, ‘Firelight’ and Pinky Winky Hydrangeas, ‘Greenspire’ Linden Trees, ‘Starlite’ Crabapple,’Ginger Wine’ Ninebark, Pin Oak, ‘Double Play’ Gold Spirea, ‘Newport’ Dwarf Doublefile Viburnum and Snowberry along with Arborvitae, grasses, Deutzia, Mugho Pine, Smokebush, Miss Kim Lilac and Weigela. The 2019 seeds are here. We are continuing to order from Renee’s Seeds. If you see something you want that we did not stock, please ask. We can probably put it on the next order. We have ordered plugs for our custom baskets and 4-inch Supertunias and Callibrochoas. We should have our little greenhouse full by mid-March and ready to sell around the 2nd week of April. For those of you who missed out on planting daffodils and tulips, we put a lot in gallon containers for you to buy in bloom. We will be dividing our pink and yellow water lilies soon. Garden knickknacks are coming from Ivystone. We plan to order bonsai and airplants again for this year, closer to the busy season.